It comes down to one match on Sunday in Sligo. A draw in Markievicz Park will be enough to maintain Derry’s Division Three status but should Offaly fail to defeat Westmeath in Mullingar, the result of Derry’s match becomes irrelevant, Offaly will join Wexford in Division Four next season. That’s the math of the thing but don’t expect Damian McErlain to be paying too much attention to it. His focus will be on improving what he saw in Celtic Park on Sunday. It’s ironic that the nine point victory was possibly the most disjointed display of the season, certainly defensively. The Oak Leafers did a lot of things well and going forward they looked capable of pulling Wexford apart in every attack. To that end the return of Padraig Cassidy was a huge boost. Last season, Damian Barton tended to use the Slaughtneil man in midfield where he is comfortable but it is that slightly deeper role that tends to get the best out of Cassidy and in the early stages on Sunday, he was Derry’s driving force. Cassidy is that rare thing in the modern game, a consistent line-breaker to borrow an American football term. He consistently punches holes in defences and in the world of mass defending that is critical. His prowess in this field often means his considerable ability to pick out a long pass is often over looked but on Sunday it was very evident. It was difficult to find much wrong with Derry going forward on Sunday. Early on Conor McAtamney couldn’t miss and six points from midfield is a superb tally but defensively Derry lacked discipline and against a better side than Wexford, Sunday’s display would have brought trouble. In the defeat to Armagh, Derry looked solid and organised, each man having a job he was sticking to the threat of Armagh meant he had to. Against Wexford, the game-plan seemed to go out the window and it became an off the cuff game of every man for himself. To be fair, Derry were never in any danger at any point but when a team scores three times as many goals as points in a half, that is cause for concern. Central to the problems is that ‘sweeper’ role in front of the full-back line. Perhaps it was a case of the contest being too easy on Sunday but more often than not on Sunday, that position was vacated as it had been during the first half in Brewster Park two weeks back and that invites trouble. It did against Fermanagh and it did against Wexford. The difference was Wexford simply weren’t good enough to take advantage. It seems like nit picking but that’s what the best teams do and Damian McErlain cut a frustrated figure after the game. “It is lapses in concentration,” he explained after the game, “It’s decision making. “A poor decision up front really puts you under pressure at the back. You have to look at why are we so open when that lapse comes and the attack breaks down. Obviously someone isn’t doing what they should be doing. The message to the players was clear. There is a game-plan in place and if you don’t follow it, someone else will. 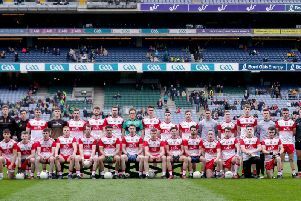 Monday’s draw between Sligo and Offaly has created an earlier than expected ‘championship’ style test for Derry but that’s where McErlain’s minor teams always thrived. Should Offaly pull off an unlikely victory in Westmeath, the loser of the Derry-Sligo game would be relegated. Neither team can afford to play with one eye on Mullingar. It’s ‘winner takes all’ because losing could be disastrous.